Seventh generation Texan, Andrea Roberts is an Assistant Professor of Urban Planning, Faculty Fellow of the Center for Heritage Conservation as well as the Institute for Sustainable Communities at Texas A &M University. She is also the founder of The Texas Freedom Colonies Project. Current projects include a book about African American historic preservation practice and statewide freedom colonies digital humanities project called the Texas Freedom Colonies Atlas. The Atlas will make disappearing historic Black settlements visible to policymakers and enable the global diaspora of freedom colony descendants to share data, organize, and co-research with scholars. From 2016-17, Andrea was an Emerging Scholar Fellow at the University of Texas (UT) at Austin School of Architecture. 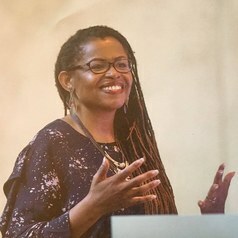 She holds a Ph.D. in Community and Regional Planning with a specialization in historic preservation and African Diaspora studies from The University of Texas at Austin (UT), an MA in Government Administration from the University of Pennsylvania (2006), and a BA in Political Science from Vassar College (1996). She brings to her scholarship 12 years’ experience in grassroots journalism, community and economic development, and government administration in Houston and Philadelphia.